Benny Andersson was a member of the Hep Stars, a Swedish rock/pop band who were very popular in their native country during the 1960s. The band was modeled after various US and UK groups of the time, such as Herman's Hermits, The Who and the Rolling Stones, and had a huge following, particularly among teenage girls. At the same time, Björn Ulvaeus fronted a skiffle group, the Hootenanny Singers, with an altogether softer and more easy-listening sound than the Hep Stars. Nevertheless, the singers' paths crossed on a number of occasions, and eventually the two found a lot in common and decided to write songs together. One of these, a track called Isn't It Easy To Say, became a big hit for the Hep Stars, and Björn sometimes guested with the band on tour. It was even suggested that the two bands merged, but in the end this never happened. 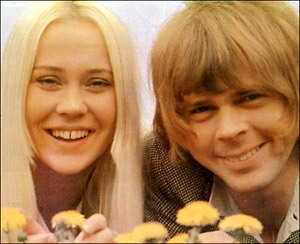 Instead, the Hep Stars manager, Stig Anderson, saw more potential in Benny and Björn working together, and encouraged them to write more songs and create an album together, eventually called Lycka (happiness) when released. In the meantime, Agnetha Fältskog was a pop phenomenon in her own right, singing light pop songs in the Shlager style, as well as cover versions of hits from groups of the day. As a result, Agnetha went on a tour of the Swedish folkparks, which was the main "live circuit" at that time. It was only a matter of time before she bumped into the Hep Stars on their folkpark tours, and so she met and fell in love with Björn. 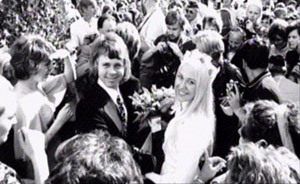 They married in 1971, in what was the Swedish celebrity wedding of the year, with huge publicity. The final piece of what was to become Abba was provided by housewife Anni-Frid "Frida" Lyngstad, who worked as a cabaret singer part time. She decided to enter a talent competition, which she won. On that particular night, Sweden changed over from driving on the left of the road to the right, and the TV companies put on a series of "big" shows to encourage people to stay off the roads. As a result, Frida was invited to appear on TV with her winning song. The TV exposure brought her to the attention of the wider public for the first time, and so her musical career took off. It was not long before she was noticed by Benny Andersson, and the two met on the inevitable folkpark tour. 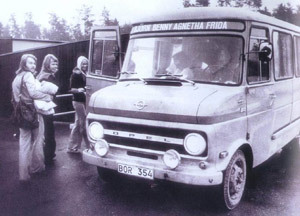 They became lovers and Benny invited Anni-Frid to sing backing vocals with Agnetha on the Lycka album. The two women were uncredited for this work. By the early 1970s, even though Björn and Agnetha were married, they both pursued their own separate musical careers. However, Stig was very ambitious and was determined to break into the mainstream international market - a feat never before achieved by a Swedish pop act. 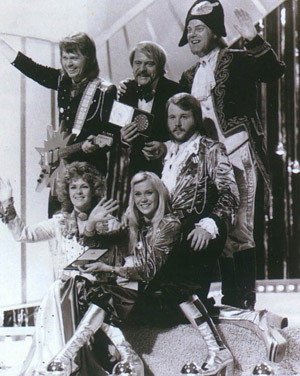 As a result he encouraged Björn and Benny to write a song for the Eurovision Song Contest for the 1972 year, which was performed by Lena Anderson. The song, Say It With a Song, came third in the contest, but was a huge hit in a number of countries, which convinced Stig he was on the right track. Björn and Benny persevered with creating hit songs, experimenting with new sounds and vocal arrangements, and started to have some success in Japan. One of the songs they came up with was People Need Love, featuring guest vocals by the girls that were given much greater prominence than previously. Everyone involved felt that it was a very good and new sound, and Stig decided to try releasing it as a single. The record was credited to "Björn & Benny, Agnetha & Anni-Frid". The song was a moderate hit, but enough to convince them that they were on to something. The following year, the group decided to have another crack at Eurovision, this time with the song Ring, Ring. For this one, the studio work was handled by Michael B. Tretow, who was permitted to try some experiments to come up with a Phil Spector-like "wall of sound". The result was the wholly new Abba Sound. For the contest, Stig arranged an English translation of the lyrics by Neil Sedaka, and they felt it was a sure-fire winner. Sadly, it wasn't - it came in third yet again. 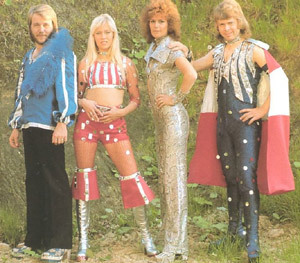 Nevertheless the proto-group decided to put out an album titled Ring Ring, and again it carried the awkward naming of "Björn, Benny, Agnetha & Frida". The album did well and the Ring Ring single was a huge hit in many parts of Europe - but Stig felt that the true breakthrough would only be to have a UK or US hit. About this time, Stig started to refer to the group privately and publicly as "Abba", having grown fed up with the unwieldy names. This was done as a joke at first, as Abba is the name of a well-known fish canning company in Sweden. However, since the fish canners were more or less unknown outside Sweden, Stig felt the name was OK in international markets, and so it stuck. The song was a UK hit, the group's first number one. It also was the first to be released in the US, where it did moderately well. However, the momentum seemed hard to maintain, and follow-up singles did nowhere near as well, partly because the group were overstretched and unable to promote these convincingly in any one territory, and partly because the songs were perhaps not as strong. It wasn't until S.O.S, a song originally written for one of Agnetha's solo projects, that Abba scored another UK top ten. This time it consolidated the band's UK presence, no longer were they dismissed as a one-hit wonder. By 1978, Abba were megastars. They built a new state of the art studio in Stockholm, and it was in demand from numerous other bands - Led Zeppelin's In Through the Out Door was recorded there, for example. 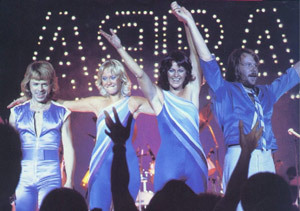 The single Summer Night City topped the charts, and set the stage for Abba's foray into the disco sound, with the album Voulez-Vous. This release started to mark the beginning of Abba's decline in Europe, while getting them considerably more attention in the US. Hits still came - Gimme, Gimme, Gimme (A Man After Midnight), Voulez-Vous, Chiquitita and I Have a Dream were all taken from this album, but in the light of Punk and New Wave in the UK, many felt that Abba were past their prime and were looking for something new. Despite a feeling that Abba were in decline, the band were still achieving huge audiences into the early 1980s, and might have continued indefinitely if it wasn't for the fact that on a personal level, the married members of the group were falling apart. For a while it was possible to keep personal and professional lives separate, and it was under this arrangement that the last two albums were recorded. However, the songs of the time - such as The Winner Takes it All and One Of Us - give a glimpse of the personal difficulties the group's members were facing. In time, it was unsustainable, and the band decided to finally split in 1982. The Visitors was to be the last "proper" album the group recorded. In the summer of 1982 Björn and Benny decided to put two hitherto unreleased songs onto a double album uncder the title ABBA - The First Ten Years. The song The Day Before You Came was literally the last song the band ever recorded, though there have been many compilations, re-releases and a live album put out by the record companies since. Abba were well known for their colourful costumes (the epitome of 1970s fashion), and also for the videos which accompanied some of their biggest hits -- these being among the earliest examples of the genre. All of Abba's videos were directed by Lasse Hallström, who also directed a feature-length film about the group, Abba - The Movie. Abba chose to make them because they preferred perfecting the songs rather than making personal appearances in all the countries where the song was likely to be a hit. Some of these videos became classics. For example, the video of "Knowing Me, Knowing You" was satirised on the BBC comedy show, Not the Nine O'Clock News, as "Super Dooper". The title Knowing Me, Knowing You was also borrowed for a spoof chat show on BBC radio and television, starring Steve Coogan as Alan Partridge, who always entered the studio shouting "Aha! ", this being the next word in the lyrics of the original song.